As you’ve probably heard, the City of West Hollywood will be working on an update to its bike & pedestrian plan for most of this year. And on Saturday, they kicked off the public meeting component with a delightful workshop, where we gathered into groups around maps of the city and drew a wish list of bike/ped improvements. Consultants for the city have been collecting data since April: conducting bike counts, analyzing collision data, and identifying problem-areas. Now, they’re ready to hear from the public. 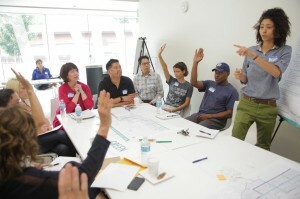 And they got an earful: by the end of the meeting, participants had heavily marked up the maps with requests for everything from traffic calming to bike racks to street furniture. So, what’s next? The city will hold more events, including group walks and rides, in the coming weeks. In the mean time, you can take a survey about your experiences biking in WeHo, and another about walking in WeHo.